The seemingly pending divorce between the New York Jets and cornerback Darrelle Revis has gotten a little uglier and, perhaps worse for the team, a little more questionable. Revis' agents, Neil Schwartz and Jonathan Feinsod, recently asked new Jets general manager John Idzik if the cornerback could be excused from the first two weeks of the team's offseason conditioning program. The two-week period starts April 15 and ends after the NFL draft, by which time Revis had been expected to be traded. However, the Tampa Bay Buccaneers, long regarded as the team most likely to trade for Revis, are apparently growing impatient with the process, three sources said. Revis wanted to avoid the awkward possibility of being hounded by the New York media and having to show up to work for a team that doesn't appear to want him long-term. However, the star cornerback needs to be at the team's offseason program in order to collect $3 million in scheduled bonuses. That's half of the $6 million that Revis is scheduled to earn this year. Revis would prefer to rehabilitate his injured knee with his personal trainer in Arizona until he knows if he'll be on the team after the draft. The way things are going, that may be a reality. While Jets owner Woody Johnson has said he is open to trading Revis or any player to help improve the team, interest in Revis has been limited to Tampa Bay as a serious bidder. The Buccaneers are not only willing to trade a combination of a first-, third- and sixth-round picks for Revis, they are also willing to pay the corner in the area of $15-16 million per year on a long-term contract. Idzik, who did not return a text message sent to him by Yahoo! Sports, has been coy about trading Revis. He has repeatedly said he is not "actively" trying to trade Revis, though multiple teams have said he is willing to listen to offers. At this point, the Bucs or any other team interested in having Revis long-term may simply wait until he becomes a free agent in the offseason rather than trade for him. If that happens, the best return the Jets might get for Revis is a third-round compensatory pick. The team could wait until October to trade him, but would have to pay Revis the $3 million bonus and part of his $3 million base salary. The Jets would also likely get much less than three picks for Revis the longer they wait. That's not to mention taking the risk that Revis either doesn't play well in his return from a knee injury or gets hurt along the way. In that case, the Jets would be on the hook for the entire $6 million Revis is owed this season and still lose him in free agency. 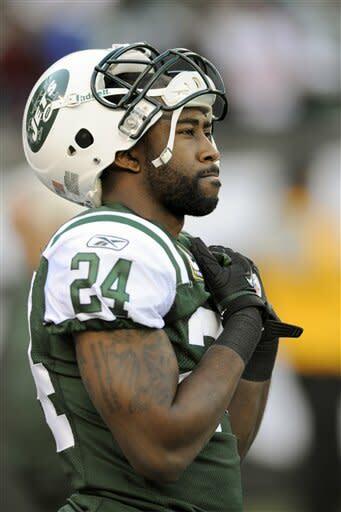 Revis can opt out of the final two years of his contract after this season. In addition, the Jets are prohibited from putting the franchise tag on him after that. Additionally, the Jets have expressed disappointment with Revis that he did not use a doctor from Atlantic Health when he had surgery to repair the anterior cruciate ligament of his knee last season. Atlantic Health is a team sponsor and has its name on the team's training facility in Florham Park, N.J.
Revis had the surgery done by orthopedic specialist Dr. Russ Warren of the Hospital for Special Surgery in New York. Warren is considered one of the top doctors in the country by athletes and is also a team doctor for the New York Giants. A source said the Jets questioned Revis on three occasions about his decision to use Warren and indicated that Atlantic Health was unhappy with the situation. • Can the NFL improve the stadium experience?